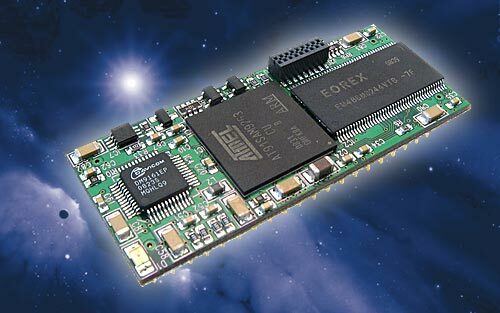 The DIL/NetPC DNP/9265 provides a very compact Atmel AT91SAM9263 32-bit ARM9-based low power embedded controller with TCP/IP stack, SDRAM/Flash memory, and a rich set of special software components for complex and sophisticated Ethernet-based embedded networking in industrial and laboratory environments. The DNP/9265 offers the footprint of a standard 40-pin DIL socket with 2.54 mm centers (0.1 inch pin grid) and all the hardware and software features which are necessary to add embedded networking capabilities to any product and system design. The DNP/9265 was developed specifically for embedded HTTP(S) client and server gateway applications that need to be connected to 10/100 Mbps Ethernet-based TCP/IP networks with minimum development costs. The DNP/9265 also supports SSV/ECC (SSV Embedded Cloud Computing) as an HTTP/HTTPS client. To interface the DNP/9265 with existing devices and other subsystems, the DNP/9265 offers three UART interfaces with TTL levels and handshake signals, an USB 2.0 host interface, a Serial Peripheral Interface (SPI) with Master/Slave Mode, an I2C Interface with Master/Slave Mode, one ISO/11898A 2.0B CAN interface, and 20 general purpose high-speed parallel (GPIO) bits. There are two ways for DNP/9265 integration: 1. Adapt the DNP/9265 to your existing product. Use the existing I/Os within your product to communicate with the DNP/9265. 2. Use the DNP/9265 to control and monitor the hardware of your existing product. This might enable you to replace your existing controller entirely. In a new product design, the DNP/9265 can be the main controller. The DNP/9265 comes as a ready-to-run embedded networking building block for Ethernet- and TCP/IP-based embedded application server usage. The rich set of prepared and preinstalled special networking software components (e.g. embedded HTTP/HTTPS server with FastCGI, HTTP/HTTPS client, SQlite database, PHP 5.3 runtime environment with JSON support, Twitter API, SSV/ECC cloud computing client) allows the creation of embedded web applications. The software also includes the on the fly graphic creation tools Gnuplot and LibGD. LibGD is an open source code library for the dynamic creation of images by programmers. GD creates PNG, JPEG and GIF images, among other formats. GD is commonly used to generate charts, graphics, thumbnails, and most anything else. Gnuplot supports many types of high-quality plots in either 2D and 3D. It can draw using lines, points, boxes, contours, vector fields, surfaces, and various associated text. It also supports various specialized plot types. A graphic file created by GD or Gnuplot can insert into a HTTP response which goes back as an answer to a web browser HTTP request. Supply current 300 mA typical / 500 mA max. DNP/9265 DIL/NetPC DNP/9265 with 192 MHz 32-bit ARM9 SoC, 32 MByte SDRAM, 32 MByte NOR Flash, Embedded Linux O/S, 3.3 VDC Vcc.